Matt Caywood is CEO and co-founder of Washington, DC-based TransitScreen. He founded TransitScreen to make cities easier for people to use — with real time information and directions available at a glance — ultimately enhancing the sustainability of cities themselves. Transportation in cities is changing rapidly as new technology-enabled mobility options like bikesharing, carsharing, and ridesharing emerge. Our mission at TransitScreen is to make information about these proliferating public and private mobility choices accessible to everyone – regardless of their age, language, or social status – allowing them to save time and money while increasing the sustainability of our cities. And we have found that public information displays have a big impact on people’s choices. How does public information work for people who can’t read information screens? In the US there are over 1.3 million legally blind people, many of whom have difficulty reading public screens, and over 100,000 totally blind people, who often depend on assistive technology like screen readers (which read text on computers out loud). Naturally, public transportation plays a major role in many of their lives. Every modern smartphone has a screen reader – Apple pioneered VoiceOver technology in 2009, and Android followed with TalkBack – and it fits in your pocket and is software upgradeable, which makes it among the most powerful accessibility devices ever created. The challenge for public information is how to get that information from a screen to a mobile device. There’s finally a good solution to the screen-to-mobile problem, and we believe it changes the game for visual accessibility. It’s a new technology called the Physical Web, which links physical objects (such as screens) to mobile websites. 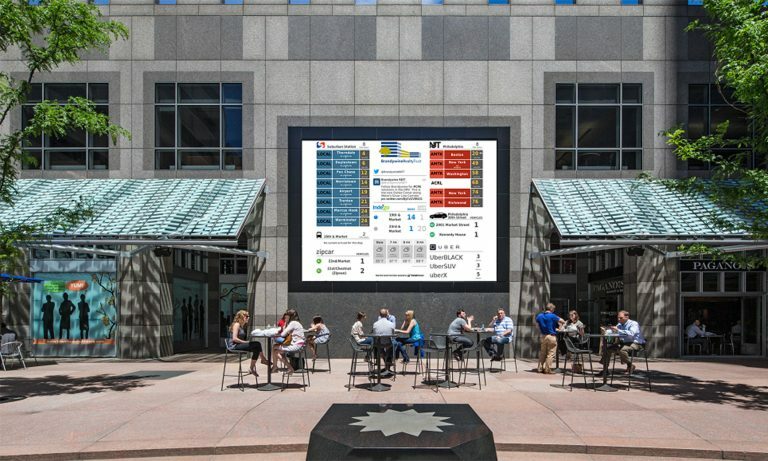 TransitScreen is currently piloting this technology in seven locations in Cambridge, Massachusetts, working with the city of Cambridge and the Cambridge Commission on Persons with Disabilities. At each TransitScreen display in Cambridge, we’ve installed a tiny beacon transmitting a Bluetooth signal up to 50 meters (200 feet) to your phone. 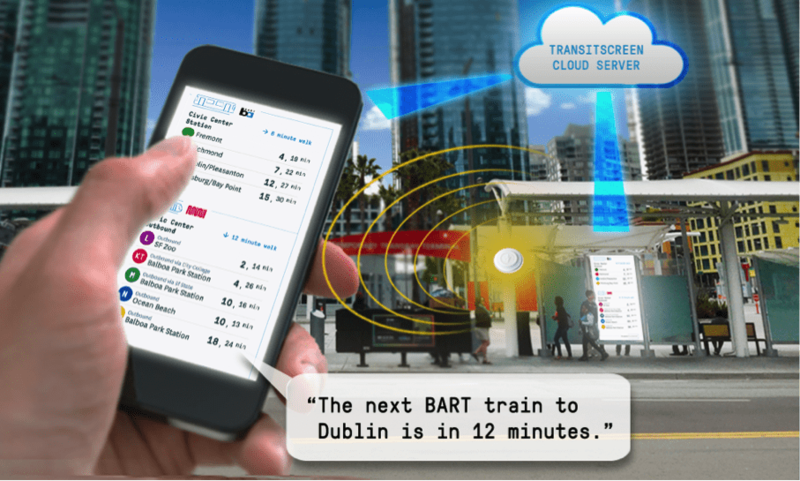 On your Android phone, you simply tap the “TransitScreen” notification; on an iPhone, you open Google’s Chrome browser (current beta version), activate the search bar and tap the “TransitScreen” notification. This loads the screen on your phone so you can interact with it. If you’re blind, you can use a screen reader. If you have low vision, you can zoom in. Even if you’re sighted, but just happen to be sitting somewhere where the screen isn’t easily visible, you can read it just the same. While we’re doing our part to allow all digital screens to be accessible, it’s not entirely up to us. The success of the Physical Web also depends on the companies that control the mobile device market – primarily Google and Apple – and how they choose to allow smartphone users to access Physical Web information. Since our original test of this technology with a group in Cambridge, we’ve observed substantial improvements to the user experience. The Android user experience is good, and the iPhone user experience has made strides. Overall, we need to look beyond the technology’s current state to its future potential. What makes the Physical Web a valuable long-term accessibility solution is universal design: products that use it will give a first-class experience to everyone, including people who are blind, visually impaired, or just sitting out of eyeshot from the information display. That benefits everyone living, working, or traveling in cities like Cambridge.